NATO opponents debate NATO apologists | Fight Back! Chicago, IL - NATO opponents debated NATO apologists at the Pritzker Military Library in the Chicago Loop on May 17. The debate was sponsored by the National Strategy Forum. Reflecting an attempt to respond to anti-war protests and mass democratic movements like the Arab Spring, the debate was titled, "Social Responsibility and National Security: Towards a New NATO." Rick Rozoff of Stop NATO and Iris Feliciano of Iraq Veterans Against the War debated J.D. Bindenagel, a former U.S. ambassador involved in NATO security policy and membership, and John Allen Williams, a professor of political science at Loyola University Chicago, who served with the NATO Inter-Allied Confederation of Reserve Officers. 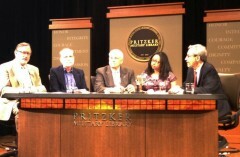 The debate is on the Pritzker website. The room was packed with media and a sizeable contingent from Iraq Veterans against the War. The Reverend Jesse Jackson, who will speak at the Sunday, May 20 CANG8-sponsored protest in Grant Park, attended. Rozoff continued, "Just a couple of reasons to terminate NATO, is that they are appropriating the exclusive prerogative of using military force from the United Nations and trying to substitute for it. NATO collectively spent $1 trillion on arms expenditures last year as we are in a worldwide economic recession." IVAW’s Feliciano, a Marine Corp veteran who served in Afghanistan, said, "Veterans are living by a thread, we are all living by a thread. There are no jobs for veterans here in Chicago. In the face of that, these military expenditures are unconscionable." Loyola University Professor Williams acknowledged that NATO is primarily a military tool of the U.S. when he said, "Complaints about NATO are really unfair. NATO is not really an organization by itself. Complaints about NATO are really complaints about the policies of component governments. I think a lot of the objections we are talking about are really to U.S. policy." The audience nearly lost its composure when the moderator claimed that NATO is an anti-violence organization. Rozoff countered, "In every instance we have seen of NATO military intervention - Bosnia, Kosovo, Afghanistan, Libya - NATO entered the fray on behalf of one group of armed belligerents against another group of armed belligerents. They did not bring peace, they won the war for their clients." The pro-NATO debaters tried to avoid the issue of Afghanistan policy and tried to focus on those wars that they claim are humanitarian missions. Ambassador J.D. Bindenagel claimed NATO has the “right of intervention” under the responsibility to protect people from genocide, crimes against humanity, or war crimes. Bindenagel further claimed that NATO intervention is done with UN sanction and authority. He cited Kosovo and Bosnia to bolster his claim. Rozoff countered, “The war against Yugoslavia in 1999 did not have UN sanction." He continued, "Subsequent to that, almost immediately after NATO marched into the former Serbian province of Kosovo with its so called Kosovo Liberation Army allies arm in arm. Within a couple of years almost a quarter of a million ethnic minorities were purged from Kosovo, ethnic Serbs, ethnic Roma, ethnic Gorans were purged, never to return. I don't hear any of the ‘humanitarian’ advocates here saying anything about those people." He finished by saying, "When NATO wages a war it does so for geopolitical objectives, siding with one side against another in a conflict, that has been its track record for the past 17 years." Feliciano said, "Iraq Veterans Against the War will be marching for reconciliation and justice on Sunday. We are here to talk about our grievances and we want the NATO generals to come meet us on Sunday - to acknowledge us. We will be returning our ‘global war on terror’ service medals and expeditionary medals. We have decided as an organization that we do not want to keep these symbols of failed politics."